Having a Walmart budget when you’d like to shop at Whole Foods? Feeling overwhelming by all the changes you’ll need to make? Wondering how to fit all the healthy tasks into your day (when you’re barely squeezing in the basics as it is)? Confusion over what changes are really important (and which ones to do first)? The Power of Real Food and Natural Living…Made EASY! I am a firm believer in the power of real food and natural living to help heal the body and create vibrancy in your life. I have personally used real food and natural living strategies to help heal and manage chronic health conditions and every day I hear incredible reports from people who are doing the same. While I am thankful that I was raised in a family where real food and natural living was utilized and respected, I still have to tell you…Making serious changes to my health as a young adult, just out of college (where I was crazy for junk food!) was difficult. It got overwhelming at times and going through the drive through or just grabbing any ol’ product off the shelf seemed SO much easier. But today, I have something to make it easier for you. What would a comprehensive resource like this be worth to the health of you and your family? I’m guessing it would be priceless because we simply cannot put a price on good health in today’s overly toxic and polluted world. 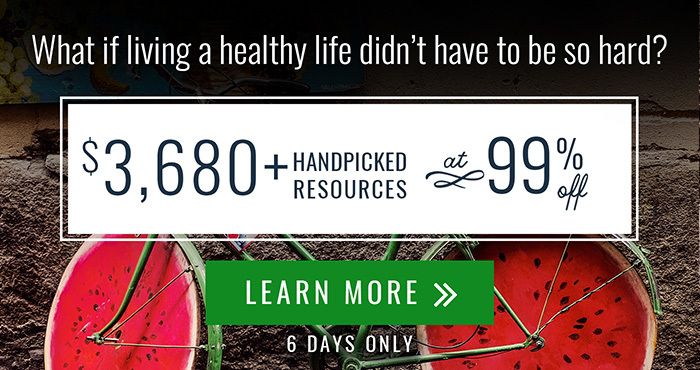 That’s why I am so excited to share this year’s Ultimate Healthy Living Bundle! 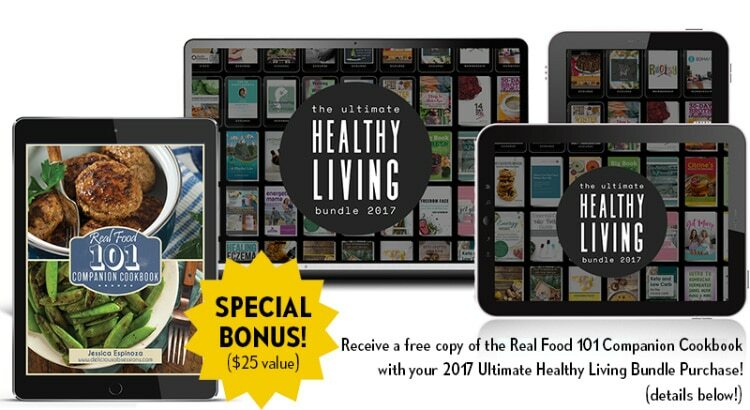 The folks at Ultimate Bundles have put together the ever so popular Ultimate Healthy Living Bundle for the sixth year in a row (hurray!). I have been a partner with them, both as an affiliate and as a contributing author, since the very beginning and it’s one of the main events that I look forward to every year. This year I am honored that they are including my popular eBook, Real Food 101: Practical Tips for Healthy Eating. 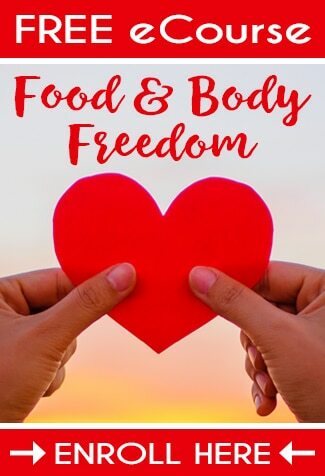 It is a blessing to be among such incredible wellness experts and practitioners all of whom are focused on helping people eat well, live well, and feel well. (psst, there is a fun Real Food 101 bonus that I’m sharing for this specific bundle, so make sure you read all the way to the bottom!). I rarely promote bundles anymore because there are just not that many that meet the high-level of quality and trust that I expect, so that is why I am such a fan of the Ultimate Bundles products. These bundles are expertly curated to ensure the highest quality content that you can find in any bundle today. Every year it’s different and every year they far exceed my expectations. They’re amazed at how many families are saying “yes!” to their health (over 80,000 and counting!) and taking them up on this super short opportunity to get a complete library of natural living resources for one teeny tiny price. Plus, it comes with over $160 worth of bonus offers (totally one of my favorite parts!). How it All Works + Real Food 101 Bonus! Besides being so incredibly helpful and inspiring, one of the things I like best about the bundle is the price. By offering the bundle for a short time only, they’re able to give you access to over $3,680 worth of high-quality eBooks, eCourses and printables for a whopping 99% off! And, as an added bonus for my readers, if you purchase the this year’s bundle and then email me your receipt, I will give you access to the Real Food 101 Companion Cookbook, which was designed to go hand-in-hand with Real Food 101 Practical Tips for Healthy Eating. This eCookbook will allow you to take the principles you learned in the main book and apply them, in action, in your kitchen. You’ll be whipping up real food meals that are full of flavor and guaranteed to please the whole family — all without slaving away for hours or breaking your grocery budget into a million pieces. 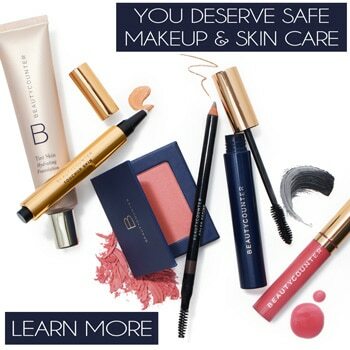 Visit their website here, take a quick look at all the goodness that comes in this package, then click the green “Buy now!” button to go through their simple and secure 3-step checkout process. Email me a copy (send to: support(AT)deliciousobsessions(DOT)com) of your receipt and I will send you the download link for the Real Food 101 Companion Cookbook which is the perfect addition to Real Food 101: Practical Tips for Healthy Eating included in this amazing bundle. I can personally attest to feeling so much better by making changes to the way I eat, the products I use, and how I take care of ourselves. It’s made all the difference in the world and I want the same for you.